Statement Win! Wilkes Barre-Scranton opened up their season Saturday night with a statement 4-3 shootout win over the 2 time defending champion (and favorite for a 3rd) Hershey Bears. This win sent a message to the rest of the AHL that the Pens mean business this year and left me more excited for the season than I was at the start of the game. Why am I so excited now? The reason is that for the most part the Pens were outplayed by Hershey. As strange as this may sound, the fact that a Penguins team not playing their best can defeat a Hershey team that looked like they have been playing for weeks may be the most exciting part of all. It makes one think about what this team would look like if everyone did play their best and it also shows that Hershey isn't unbeatable this season. (good to have confidence against a team that you play 9 more times) Kyle Greentree and the Bears opened up the scoring early, but the Pens were quickly able to answer with strikes from Chris Collins and Nick Johnson to grab a 2-1 lead. They should have actually been given a 3rd goal, as Holtby clearly fell back into the net with the puck but the referees blew the whistle and did not signal a goal. The Bears answered Johnson's goal with a strike of their own from Steve Pinizzotto after he was left all alone on a breakaway. 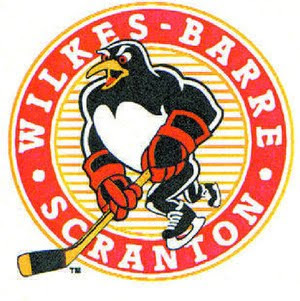 The Pens jumped back out in the 2nd period when Tim Wallace drove to the net and Andrew Hutchinson was able to skate up and slam home the rebound, but they just could not hold off Hershey's powerplay and Keith Auccoin. The overtime period was mostly uneventful, and the shootout did not start off well for the Pens after Dustin Jeffrey tried one too many dekes and missed. Things got even scarier when Francois Bouchard connected on his attempt to put the Bears up 1-0. WBS was just getting started though, as they answered with an onslaught of great shots. Nick Johnson took a nice straight path to the goal and just pounded one home past Holtby, Geoff Walker put a spectacular last minute deke on Holtby for the circus shot goal, and Brett Sterling did what he does best with a lightning shot past Holtby to put the Pens up 3-1 in the shootout. Theissen stopped all 3 of his final shots and the Pens fans rose in an ovation to their team and perhaps the most promising season in the 11 year history of the franchise. But I don't want to get ahead of myself here, and now it's time to calm down from this win and start working out some of the defensive kinks (especially from the Sneep-Wagner pairing) before the Adirondack game on Tuesday.